Drumming were grade eight students (clockwise from lower left) Chaz Yellowbird, Jordan Koe and Clint Yellowbird, and Lakedell Grade Five student Kearton Roan. Lakedell School kicked off its new Culture Days program with a half day celebration of Native Culture. The program will continue after school every other week on Wednesdays and will include activities honouring all cultures in areas such as crafts, cooking, music, and sports. The kick off to the program was planned, organized and led by Cedar Beaudette-Hodsman and John Green, two students in the Faculty of Native Studies at the University of Alberta. As part of their course in Community Service Learning, they have spent some time at Lakedell School and planned the Culture Days program. The kick off program involved four activity stations through which all students rotated. At one activity station, the children could choose from a very wide range of colours to make a bead bracelet. One activity station involved making and eating bannock, also known as fried bread or Nawasi Pahkwesikan. 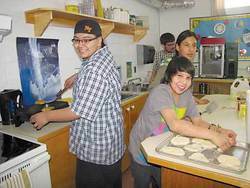 The elementary school students worked and shaped the dough ready for frying and ate it with jam, but the actual cooking was done by three Grade Eight students from Pigeon Lake Regional School who came to help with the program. This day the bannock was fried, but it may also be baked. The actual dough is very similar to that used in baking powder biscuits. The gym was used for parachute tag. Most of the participants hold the edges of a parachute, keeping it spread out and moving up and down. One child is in the middle of the parachute. Another child is under the parachute. The object of the game is for the child inside the parachute to locate and tag the child who is underneath. Those holding the edges of the parachute can, of course, make this easier or harder. The children take turns until all have been both in the middle and underneath. The students appeared to really enjoy this excellent game. Outdoors, there was an introduction to lacrosse. The field was still snow covered, which somewhat hampered play. There was not adequate time to get a good sense of the skills and tactics involved in the game, but it did serve to increase awareness and understanding of this burgeoning sport adapted from the Native game. The day closed with the students forming a circle in the gym to enjoy a drumming demonstration put on by the Pigeon Lake Regional School students, Jordan Koe, Clint Yellowbird, and Chaz Yellowbird, joined by Grade Five student Kearton Roan. Of course, appreciation was expressed for all the organizers and volunteers. The kick off to the Culture Days program was a fun time, thoroughly enjoyed by most of the students, although one little girl did go muttering down the hall, “It's so boring!” The claim is that all cultures will be honoured, but I wonder when I see the opportunity to honour the Ukrainian Culture with its beautiful Easter eggs made with such intricate detail and meaning completely ignored in a kick off on Maundy Thursday, the most appropriate day of the year to so honour this culture which made a giant Easter egg the symbol of one of its villages in Alberta. Honouring all cultures means honouring ALL cultures.